Navesink Fitness is a friends and family fitness center, led by Rob and Mike Knox who have been coaches and trainers for 23 years. The atmosphere is friendly and welcoming – we are not a Big Box gym and let you decide whether you want to join after meeting us – we don’t believe in “closed door” high pressure sales. We offer a full complement of Group Classes, aerobic equipment, exercise machines and free weights. We are always there to ensure you are using the equipment to your best advantage. We offer individual training packages to members of all ages – seniors to grade school. Our special program – Ten Week Body Transformation is very popular – it combines 10 personal training sessions with specific high protein meal choices that yield long term sustainable improvements in muscle tone and weight - not yo-yo weight loss. Accurate before and after pictures are available to give you a sense of what you could accomplish. We are located on Rt. 36 next to the A&P – midway between the Highlands and Atlantic Highlands and 4 minutes from the Oceanic Bridge to Rumson. 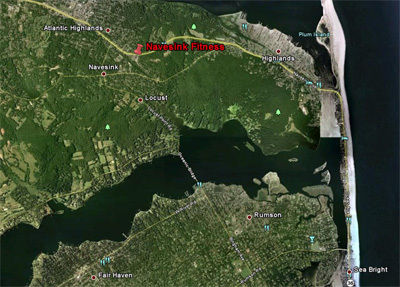 Many of our members work out and then conveniently shop at the neighboring A&P and the Navesink Fish Market.